The French paper producer Clairefontaine has set up the latest in technology in all its warehouse fulfilment processes and has enlarged its warehouse in Alsacia (France). All its operations are fully-automated, which requires scarcely any operator intervention. Mecalux played a major role in this project from the start, designing and implementing the most efficient solutions that have helped the company reinforce its competitive edge and leadership in the sector, both now and in the future. Clairefontaine is one of longest standing paper companies in France. On top of manufacturing up to 170,000 tonnes of product a year, its product range includes office and printer supplies. It started out in 1858 in the town of Étival-Clairefontaine –benefiting from its riverside location– and swiftly became one of the most important industries of the region. The company excels at moving with market developments and at using the latest technology in all production processes. Keeping the group’s business strategy in mind, Clairefontaine has reorganised the operations of its logistics centre in Alsacia, which is the launching point for distributing goods to its customers around the world. The company required a large storage capacity, and to service customers faster and more efficiently. The technical team of Mecalux worked jointly with the one from Clairefontaine to develop a solution that would resolve its warehouse fulfilment requirements. After a thorough analysis, the result is a logistics centre comprised of three warehouses with fully-automated operations. The advantages of this solutions include: perfect management of the goods, increased productivity and high availability, by being able to operate non-stop 24 hours a day. Also, these minimise personnel costs (eliminating reliance on traditional handling equipment) and those from processing. The centre is located on a long stretch of land. Moving the goods from the production centre to the assigned warehouses represents very high handling costs, precisely what had to be cut. That is why the company also decided to automate its in-house transport. From the outset, Clairefontaine proposed fully automating all its operations in its logistics centre, including in-house transport, with the installation of automatically guided vehicles (AGV). The AGVs carry out the functions that, in an unautomated warehouse, would be done by operators via traditional forklifts, such as moving the goods from the production centre to the warehouse. Running these AGVs frees up otherwise unavailable space and keeps walkways completely open. An aisle was opened up on one side of the pallet rack warehouse to give access to the warehouse that operates via the automatic Pallet Shuttle system –which is further away. AGVs are the only equipment that circulates in that area. The majority of pallets flowing from the production centre are non-standard size pallets. That is why slave pallets are placed to ensure load strength and stability inside the warehouse. A conveyor circuit was installed with a pallet load stacker to carry out this operation. The stacker deposits the goods on top of slave pallets. After that, all pallets pass obligatorily through the checkpoint area, where it is verified that they are in good condition and their weight and measurements correspond to the quality requirements of the warehouse. Goods that leave the warehouse and arrive to dispatch are reinserted onto the conveyor circuit. In this instance, the slave pallet is retrieved to be used at some other time with new loads coming from production. Pallets leaving the warehouse are moved to the preloading area, located in front of the loading docks. There, they are grouped by order or route and are ready to be put into distribution lorries. This installation is set aside for high turnover products. The Pallet Shuttle is a high-density system that offers the maximum storage capacity and speeds up pallet inputs and outputs with the assistance of autonomous shuttles. This involves a solution that is ideal for high turnover products and those with a large volume of pallets per SKU. The warehouse, 15 m tall and 146 m long, has three aisles with a block of racks on each side that hold between five and seven pallets deep. Pallets are 800 x 1,200 mm, with a maximum unitary weight of 900 kg, and come in four different heights: 1,095 mm, 1,395 mm, 1,645 mm or 1,745 mm. The distribution of the goods accounts for these measurements, allocating smaller pallets to lower shelves and larger ones to upper shelves. Overall, there is a 20,611 pallet storage capacity available. This version of the Pallet Shuttle system is entirely automated, since it uses three stacker cranes (one per aisle) as conveying equipment from the input and output positions of the warehouse to any storage channel. Automatic shuttles are housed in the cradle of the stacker crane and, on arrival to the corresponding channel, raise the pallet slightly and insert it inside, running along the rails up to the first open location. Next, it lowers the pallet and rests it on top of the rail. This same operation takes place, but in reverse, when goods are extracted. It comprises one 93 m long aisle with single-depth pallet racks on both sides. 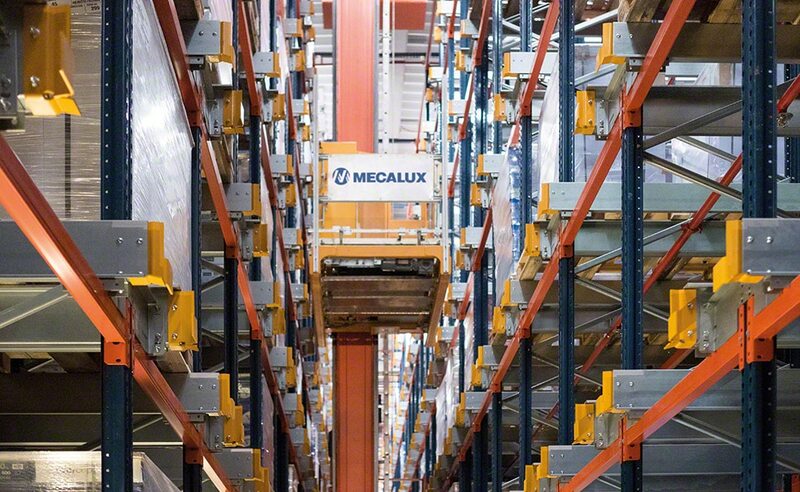 Four storage levels, standing 7.6 m tall, provide a total pallet capacity of 744. SKUs essential for picking tasks are located here. A single-mast stacker crane circulates in the aisle responsible for moving the goods between the locations on the racks and the input and output conveyors located at one end of the aisle. This machine works at a travel speed of 180 m/min and 38 m/min when raised, with a potential above what is needed and which will meet the future growth of Clairefontaine. Two U-shaped picking stations are set up on one end of the racks. A transfer car organises this area and distributes pallets from the warehouse in each of these stations. The picking stations have the equipment to run operations, like PCs or hydraulic tables that move to a more ergonomic position. The operator collects the boxes directly off the pallets originating from the warehouse and deposits them on the destination pallets for orders. Next to the picking stations is a consolidation area, where finished orders are verified, pallets are stretch wrapped, and labelling and issuing of the required dispatch documents take place. The automated warehouse and the picking stations are enclosed in protective metal mesh with an access door to safeguard the workers and the stored products. A total of seven aisles are enabled with pallet racks on both sides. Low turnover products are stored in these racks, in addition to special products that some customer may specifically order. Aisles are 1.8 m wide. This system maximises the available area to obtain a storage capacity of 5,985 pallets. These racks allow direct access to all pallets, providing great flexibility when managing the goods and the picking tasks Automatic trilateral forklifts are used to handle the goods. These machines operate exclusively inside the aisles, inserting and extracting pallets from their locations. AGV forklifts bring or take goods from the ends of the aisles. Due to the magnitude and complexity of this project, Clairefontaine needed an efficient WMS (Warehouse Management System) able to run all in-warehouse operations. Absolute control over the management of the warehouse. Manage the entry and exit of goods. Assign a location based on the characteristics and turnover of the products. Design the exit order of the goods. Mecalux also set up the Galileo control module, which ensures all electromechanical components of the logistics centre run smoothly and the compliance of the safety measures. Greater storage capacity: by revamping its logistics centre, Clairefontaine has cashed in on 27,340 pallet locations. Automated management: automated warehouses provide a steady flow of goods and a streamlined order picking system, with minimal operator intervention. Ideal layout of the goods: each product is deposited in the corresponding warehouse taking into account its characteristics and turnover.